We all love a bit of sun, but during these lovely hot months make up can be quite frustrating to stay put! Apart from sun block, I’ve picked out 4 of my beauty “essentials” to help keep make up in place on even the most oiliest of skins! I’ve wrote about this moisturiser quite a few times here on Beauty Aesthetic. Even during the colder months I find it hard to keep my skin from becoming oily so the last thing you want is your make up to melt off in the heat! This is a great moisturiser to prime your face to make sure your make up lasts all day. Not to mention, it smells amazing! This has also made an appearance on our blog before and is a favourite of both of ours. In the summer I feel like my skin needs a little bit extra product to keep it looking fresh and to ensure my foundation doesn’t go patchy. This is a great primer which applies like a cream to powder so you don’t have to wait around for it to dry to put your make up on. This is the most expensive face product I’ve ever purchased at £38 and is worth every penny. I received a sample of it in a magazine a couple of years ago and I was instantly hooked. I use this serum on special occasions and it makes your skin the softest it’s ever been, it’s unlike anything I’ve ever used before. It makes an amazing face primer, keeps oily skin shine free and makes your pores visibly reduced, I just wish I could justify wearing it everyday! If you get a chance to go to an Estée Lauder counter, try it out and you’ll see what I mean. I originally wanted to include the Skindinavia setting sprays but I must have run out! This setting spray is just as good and is very cheap! Just spray some onto your face, before and after make up and it will stay put for longer. It’s also great to use if you feel like you’ve put a little bit too much powder on, just spray a little on your face and it will look less cakey! 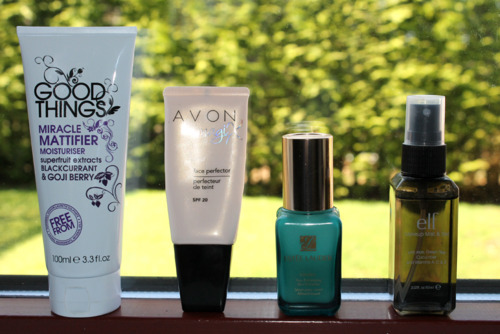 It’s great to carry in your bag as a little skin refresher too, especially for summer! I was interesting in finding the miracle mattifier but can't seem to find it on amazon or ebay.. I live in CA, is this only sold in the UK?